100% light blocking. Blocks light from all angles. Stellar Deluxe sleep mask is Sleepstar’s flagship mask, already helping thousands to sleep better. Handmade with luxurious suede and lined with breathable jersey cotton, the Stellar Deluxe eye mask has been expertly crafted to block out light for all faces and head sizes. The sleep mask is perfect for home or travel. Uniquely designed to prevent light coming in from all angles. The Stellar gives ample coverage above, below and to the side of the eyes without being bulky. The Stellar has a special internal layer of blackout material to ensure complete darkness. Superbly designed with a soft, nose padding piece that blocks light coming in. This internal padding gently sits and molds to the contours of your individual nose and cheeks ensuring light is blocked out for all face types and helps ensure a cosy fit. The Stellar has internal eye chambers crafted into the soft padding of the mask creating ample space around your eyes. The mask doesn’t pull down or apply weight on the eyes. These eye chambers help create a sense of well being. You can open and shut your eyes whilst wearing the mask. Handcrafted with soft suede, and 100% breathable jersey cotton, the Stellar is designed to impress with its distinctive slim shape. Also available in: cherry red, midnight blue, charcoal and hot pink. With soft velcro headbands, the sleep mask is fully adjustable to fit all head sizes. Related links to "Stellar Deluxe Sleep Mask - Charcoal"
Customer Review for "Stellar Deluxe Sleep Mask - Charcoal"
Love this mask, I have been using them for years. At last, a decent night's sleep! 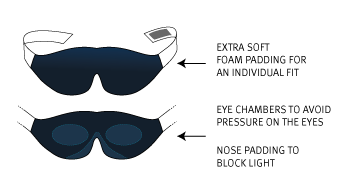 Unlike cheaper eyemasks, it is moulded to your face and blocks out ALL light - it is really comfy and the straps can be adjusted. Well worth the money and has made a huge difference to my sleep. Now just got to stop my other half snoring! Blocks light well and is mostly comfortable to wear. However the straps (which are superbly adjustable) mean that the pressure is all over the eyebrows and lower forehead. Not ideal if you have a headache or migraine. Too loose and it slides around all over the place. Despite that it is still better than some that cost twice the price. Adjustable strap, no pressure on the eyes, very comfortable, blocks lights (and I mean a lot of light) effectively. Looks like it is going to be the best slipping mask I have tried the last 10 years. I totally recommend it.